Protein, calcium, pro-biotics, anti-inflammatory, gluten-free, and filling, this bowl has it all! 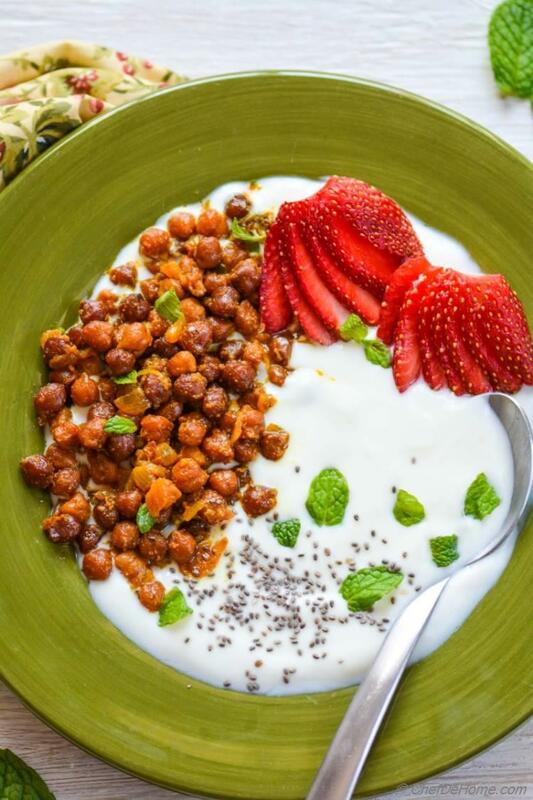 Sharing with you one of my favorite breakfast bowl, gluten free Masala Chickpeas and Yogurt, packed with calcium and pro-biotics! I love yogurt! Give me bowl of yogurt, for lunch, for breakfast, and I won't mind ever! With day-to-day routine, I often used to miss eating yogurt regularly..... so these days, for regularity, I try to include it in my every-day foods! I always find those "ready-to-eat pro-biotic shot" little expensive.... yogurt is easiest and cost-effective way to take pro-biotics, and a few other things which we will discuss some other day. In one line, anything that can help heal our gut! Like if your body can digest fermented foods - Kimchi or Kombocha, all have similar gut-friendly characteristics! What worked BEST, so far for me, to eat more yogurt? I would say, including in daily routine diet! Breakfast, dips, spreads, or desserts... daily routine foods can help us eat more yogurt! This yogurt and Masala Chickpea bowl has become a weekly ritual in my family! Often, I soak dried black chickpeas at night, in morning, just boil'em quickly, add salt and black pepper and pack for lunch...... for quick, healthy, and fibrous-munch-snack. 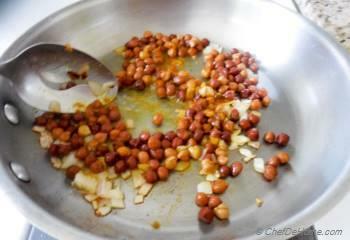 Some days, after boiling chickpeas, I pan fry'em with curry powder and shallots to make Masala Chickpeas which we eat for breakfast with yogurt! 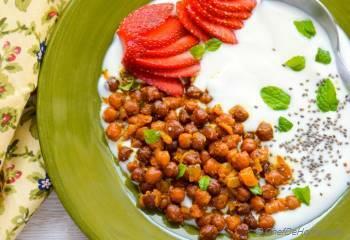 Other than all benefits of yogurt, yogurt also act as cooling element with spiced chickpeas! Since, I always have a cup or so of soaked chickpeas on kitchen counter, often these sprout and I add'em to salad, towards end of week, like Kale and Chickpeas Sprout Salad, I shared with you sometime back. Recently, I tried one more thing, GROWING own garbanzos i.e. fresh green chickpeas :) Thing is, when I'm not in mood to use the sprouts, and week is almost over, I put sprouted chickpeas in a wide flower pot in my patio. And they grow pretty good! This picture, I took after 2 week's growth. 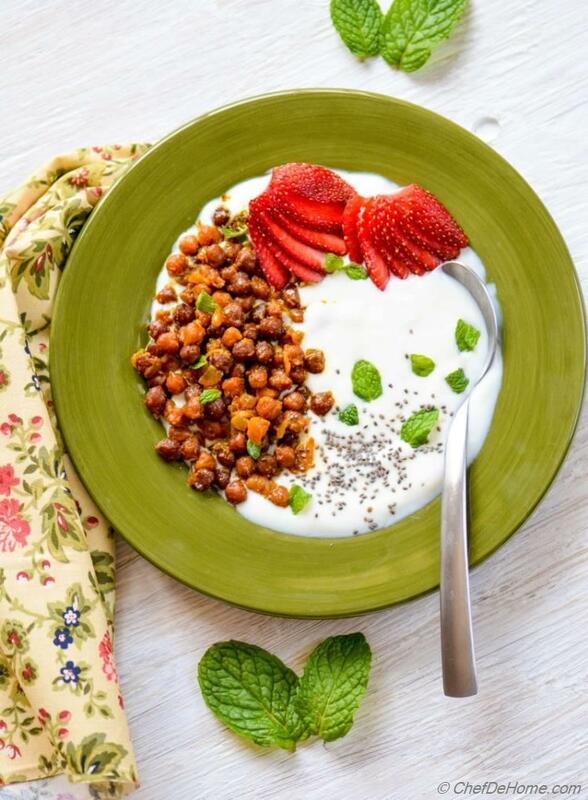 This breakfast bowl is completely gluten free, has calcium and pro-biotics from non-fat yogurt, has good serving of fiber, protein, and iron from black chickpeas, and anti-inflammatory dose of turmeric from curry powder. Ending Friday with this Healthy breakfast Bowl! I hope you like it! Total Time 30 minutes Prep Time 10 minutes Cook Time 20 minutes Difficulty Easy Yields 2 Servings Serves 2 Notes If using fresh, need overnight soaking of dried black chickpeas. Smart Swap Can't find Chia seeds? You can also use flax seeds or Hemp seeds. 1. If using canned chickpeas, skip this step and save 15 minutes. 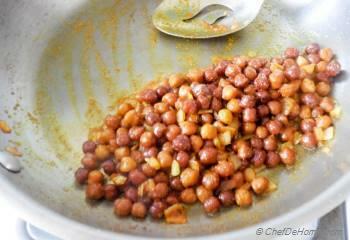 Or in a deep sauce pan, add pre-soaked black or white chickpeas with 2 cups of water and 1/4 teaspoon of salt. 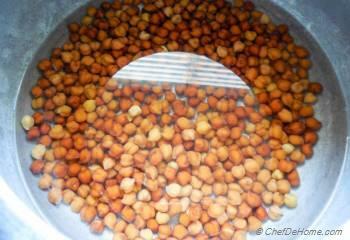 Boil for 12-15 minutes or until chickpeas are done to your liking. 3. Add curry powder and cook for 1 more minute. Remove from heat. Add lemon juice, salt and black pepper as per taste. Set aside. 4. 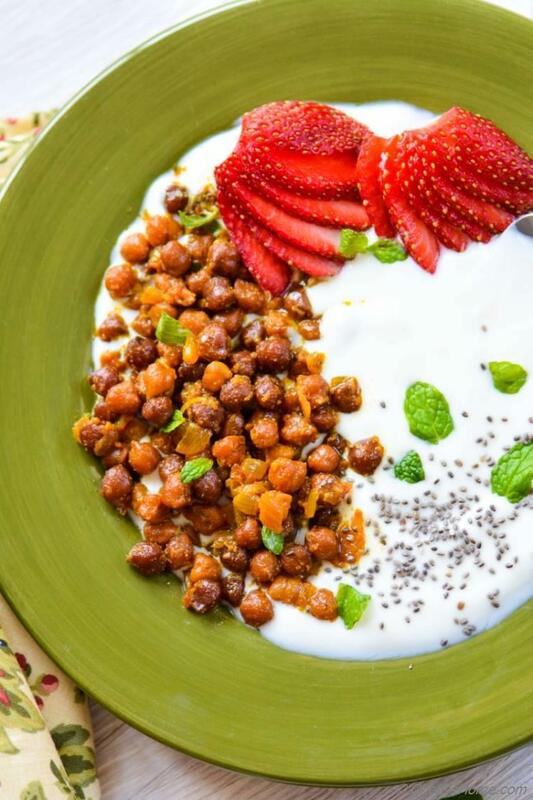 In two bowls, divide yogurt, chia seeds, strawberries, chickpeas equally. Garnish with some fresh mint and serve! Use non-fat yogurt. 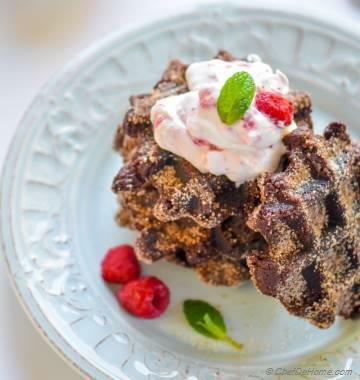 Beat yogurt slightly with whisk for a appealing creamy texture. 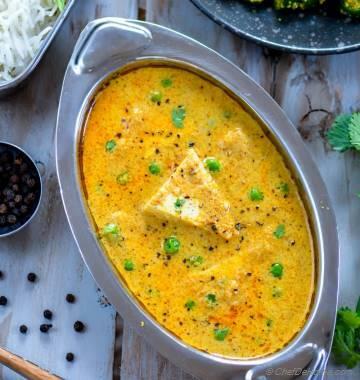 Don't season yogurt as masala chickpeas will compensate for the salt. Dannii, thank you so much! 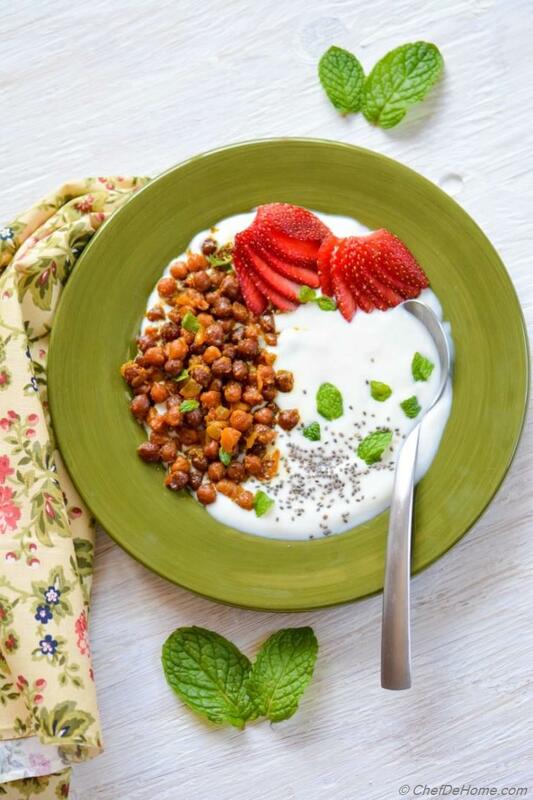 I never would have thought to have chickpeas with breakfast, but what a fantastic idea! Anupama, thanks! Oh yeah! 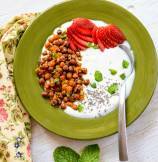 chickpeas for breakfast with yogurt! always a hit! isn't it? 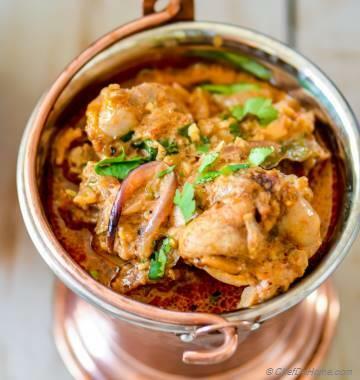 jayashree, thanks for stopping by! I'm glad we have similar taste! Cheri, thanks! indeed, growing own garbanzos is a great experience! loving it! 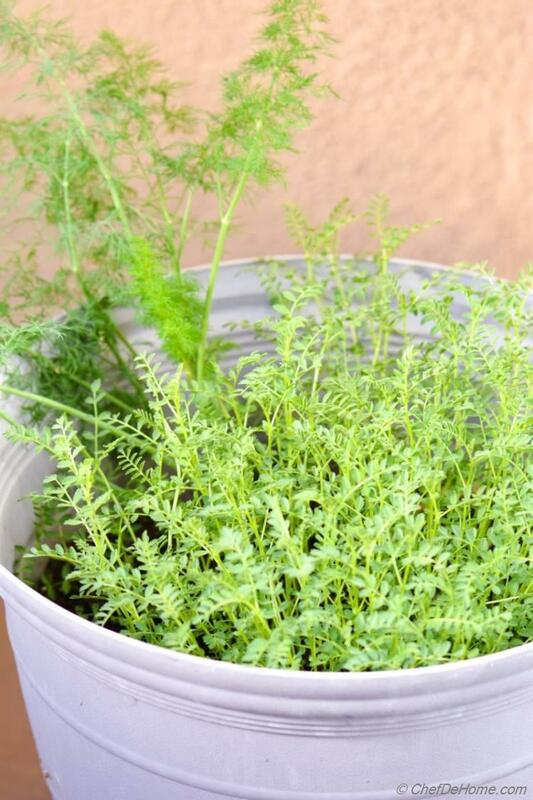 I Love that you tried growing your own garbanzos, great recipe! :) thanks, Manali! sure! please do try!